Here's one that was news to me: a DR. STRANGE SINGLE released around September 1982. This blatant plug, wrapped-up in the form of a competition, was a half-page feature in THE INCREDIBLE HULK (second series) issue 25, 15 September 1982. 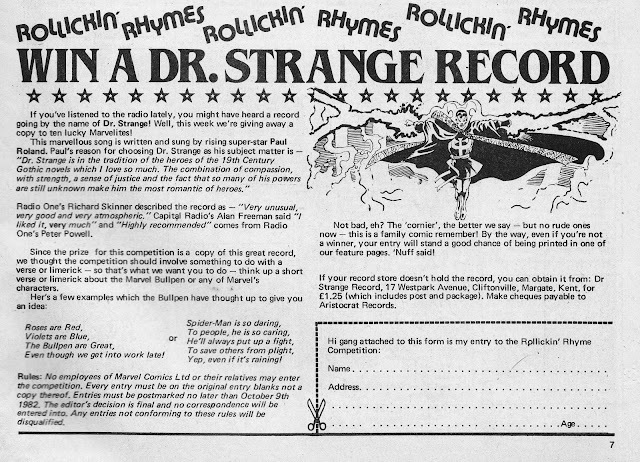 Do you own a copy of this sure-to-be-amazing piece of mighty Marvel musical history? Have you played it anytime in the past thirty-odd years? Is there a copy lurking online somewhere?